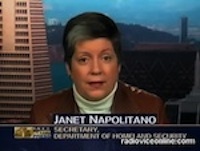 Homeland security chief Janet Napolitano needs to be fired immediately. As everyone knows last week she came out with and defended this document which asserts that Americans carrying out their constitutional and patriotic duty to have their voices heard are right wing extremists. This was a political stunt designed to lump together military veterans and anyone with a conservative ilk, with Nazi skin head white supremacists and consider them all a threat. This is an attempt to disassociate credibility from anyone that wishes to express and defend their constitutional rights. I honestly do not think I personally lean to the right, nor do I lean to the left, I am politically agnostic. I look at what I personally think is in the best interest of this country and that is what I support. Napolitano is derelict in her duty to defend the homeland and defend the constitution. Homeland security is not a joke. It is not an agency that should be used as a tool to inject the suggestion that patriotic Americans are dangerous threats to our republic. I have read a couple of articles today demonstrating her inability to concern herself with real problems. Napolitano raised concerns in Canada with remarks indicating she wants to clamp down on border security, which businesses fear could throttle vital trade flows. Janet, there is a border to the south. Swarms of people, many of which are criminals, flow across that border on a daily basis. In some areas there are terrorist drug lords threatening and killing our police officers. These are not Islamic terrorists but they are terrorizing citizens of this country and they are making our country less safe. Stop marginalizing the major issue with the southern border. In the text of this speech she seems to have this attitude of fairness, she almost personifies the border and doesn’t want to cause one to feel like the red-headed step child. These borders are NOT equal by any means. First, here is our approach. There needs to be some level of parity between the two borders. We don’t want to appear to go heavy on the southern border and light on the northern border. We will have a balanced approach, consistent with effective security for our entire country. The bottom line here is that she is NOT fit to serve. She is a political hack carrying out a political agenda and this is unacceptable. She doesn’t know immigration law or how the 9/11 hijackers got here, and she can’t manage a report on a topic as sensitive as domestic terrorism without insulting vets, but hey — at least she doesn’t owe back taxes. Who could have guessed that the title of Most Hapless Obama Appointee would pass so soon from Geithner? and based on Erik’s post I can’t say I disagree. I will say it is refreshing that if she does resign, for once it won’t be because of taxes, it will just be incompetence. 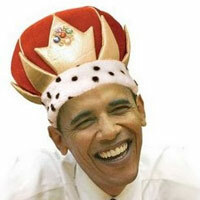 Are we heading for an Øbama illegal alien trifecta? We're spending how much for a mascot? Inept, ignorant, ineffective….words fail me with this woman. If there was ever a political hack, this woman is it. She almost makes Janet Reno look good! I shudder to think of the gravity of the end results of her pathetic performance. Can't blame Bush for this piece of work. My fingers are getting tired of dialing my elected officials. Let us not forget that the US military is supposed to be in charge of protectinng our great land from enemies foreign and domestic. And we have Hoemland Security doing this because ? ! ? ! ? PatRiot you can stop dialing, they are not listening. If you want to make change you need to encourage your friends and neighbors to educate themselves before they vote. Napolitano is Jamie Gorelick II and is going to be instrumental in bringing this country 9/11 II. Krauthammer: Obama, Bush, and the torture show trials Can your car handle more ethanol?